To find out more about Coop Voisins, or membership, call our Coop Coordinator at (613) 565-0284 or email our Coop Coordinator at coopvoisins@rogers.com. Our fax number is (613) 565-3050. 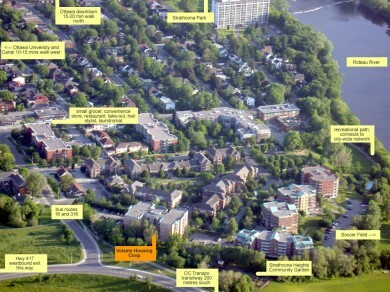 Coop Voisins is centrally located, in the “Sandy Hill” neighbourhood of Ottawa. You can walk downtown in just 20 minutes. We are close to Highway 417 (exit Lees/Mann) and an extensive public transportation network that can take you anywhere in the city. While close to downtown, Coop Voisins is located near a suprising amount of green and recreational space. Strathcona Park, running along the Rideau River, offers bike and walking paths, a soccer field, wading pool, play areas and outdoor theatre spaces. Two community gardens are in the neighbourhood. You can find detailed directions and map to Coop Voisins on Google. Copyright © 2013 – 2019 Cooperative D'Habitation Voisins Inc.